It all began with our daughter’s history homework: “Write down your ancestors back to your great-grandparents!” While I already had a large family tree of my ancestors going back to the mid-eighteenth century, my husband Axel’s branch was broken when it came to his grandfather. Who has been there before that break? Before the Jewish grandfather Albert Tobias, who didn’t survive the Third Reich? And what exactly had happened? The house with the former shop of Albert Tobias in Solingen-Wald. The past had been too painful for the relatives to talk about. No one wanted to tell anything while there was time to ask. Now there were no memories, no souvenirs, no photos, no letters, no stories. 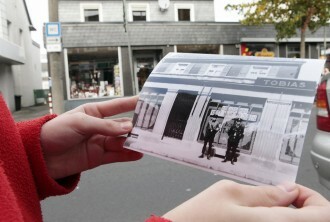 Tiny pieces of information – Albert’s father a butcher from Neuwied? Several times, search engines had found only an Albert Tobias from Cologne-Porz, a Jewish butcher for whom an alley in Porz is named. But this time, in September 2011, somewhere on the third page of the search results, I found the family tree of Robert Tobias from Connecticut, which mentioned Albert Tobias, son of Moses and Jettchen Tobias of Heimbach-Weis, Neuwied. With this information the Neuwied ancestry was fairly soon clarified and there was a big surprise: not only was there a “Stolperstein” for Albert infront of his house in Solingen, but there was also one in front of his birth place in Heimbach! Rolf Wüst from the Neuwied German-Israeli Friends Association was the one who requested the stone, and he connected us with Albert’s nieces, so far completely unknown relatives. “Yes, sure I remember Albert! He was like a second father to me,” the 78-year-old Elfriede soon told me on the phone. Her father Max had gotten his brother Albert out of Dachau, and until his deportation Albert lived with her family in Cologne. Unfortunately, Elfriede died suddenly shortly before our first meeting. Surely she would have had a lot more to tell. But she wasn’t destined to remain the only unknown relative we got to know during our research. Nevertheless many things remained unclear. Why didn’t Albert emigrate as his brother Max announced in the letter to the administrative office of Dachau? How could he run his clothing business so well all the way up to Kristallnacht, the Pogrom of 1938? How did his wife manage to protect her two sons from the persecution of “Halfjews” that intensified after 1942? Beyond that there were family members who managed to get out before 1940, who today mainly live in the Hartford area of Connecticut; most of them are still Jewish. Robert Tobias of Hartford is the one who published the family tree of Tobias Herz that put me onto the trace of Albert’s ancestors. We corresponded busily; I could do research in Germany and translate, he has some information and documents that his relatives were able to rescue. So we developed the puzzle of a widespread family that once was settled around Puderbach and Dierdorf, pursuing typical Jewish peddler professions, and then spreading out at the beginning of the 20th century, starting to be emancipated vocationally and suddenly being violently scattered. My acknowledgements go to all of those who for decades have been documenting the past of their communities, some of them dealing with heavy resistance; to those who invest hours and hours to analyze documents in order to make them accessible to the public; to those who make it possible to reach the public at large – museums, institutions and private initiatives, especially the NS-documentation center Cologne, which gave us a lot of hints and information, e.g. from the state archive of Lodz. The biggest genealogical work has been done by Dr. Ted Tobias of New Jersey, who put together genealogical “family books” drawn from the documents about the Jewish communities that are kept at the state archive of Koblenz and updated them with current data. Almost all work on Jews from the Westerwald is built upon this data treasure-trove. 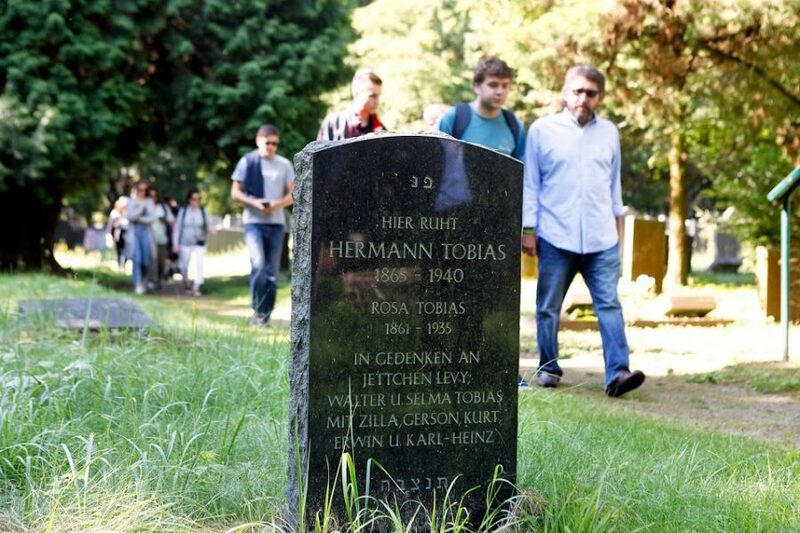 Many Jewish cemeteries today are the final witnesses of the lost Jewish heritage in Germany. They are protected by landmark status, but the ravages of time are wearing at them, as well as occasional mutilation by brute force. More and more stumbling stones are being placed in commemoration for those who were killed far from home and were denied a final resting place. In November 2011 we went to Israel and visited Yad Vashem. In the summer of 2012 we travelled to the East for the first time, visiting Lodz, Kulmhof (Chelmno) and Riga. In April 2013 Robert Tobias and his family came to Germany for the first time and in October 2014 we were happy to finally meet our family in Connecticut. We appreciate very much being able to make these connections that were almost missed, and to get in touch with a past that was untouchable for two generations. I hope the puzzle will grow and develop, that further contacts will be created, providing answers but also the ability to ask new questions.